http://www.meistermusic.org/wp-content/uploads/sites/16/2013/03/La-Monnaie.jpg 183 275 Elisabeth http://www.meistermusic.org/wp-content/uploads/sites/16/2015/05/mmlogo1-300x300.png Elisabeth2013-03-06 15:38:142015-06-01 21:17:26Unexpected La Monnaie debut TONIGHT! You’ll be the finest Lucrezia since Dame Joan and of that I’m sure. It always sounds better when a powerful voice is used, especially one with such an excellent technique. A rare opportunity to catch you singing bel canto before you are whisked away for ever into the heavier realms of Strauss and Wagner. 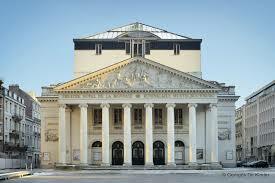 I heard you in the rôle of of Donna Lucrezia at the Brussels La Monnaie yesterday. WOW!!! You were simply wonderful and I just wanted to thank you for a superb performance and for giving us all such a splendid evening. Hope to hear you again – soon ! What a lovely message, thank you so much! It was a wonderful experience and fantastic to get to work with such brilliant musicians, as well as the wonderful ASM who walked the role.